There's nothing we like more than a good beer and food match, so we were pleased to be invited to this event hosted by Euroboozer who have just started importing SKA canned beers to the UK. 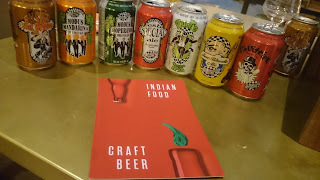 It didn't disappoint and we enjoyed an evening of great beer paired with some fantastic Indian cooking provided by new Brixton restaurant BOOMA. A few highlights are below. SKA Pinstripe Red Ale - 5.2% ABV (Poppadoms); A thoroughly drinkable British style bitter, brewed with Liberty hops. 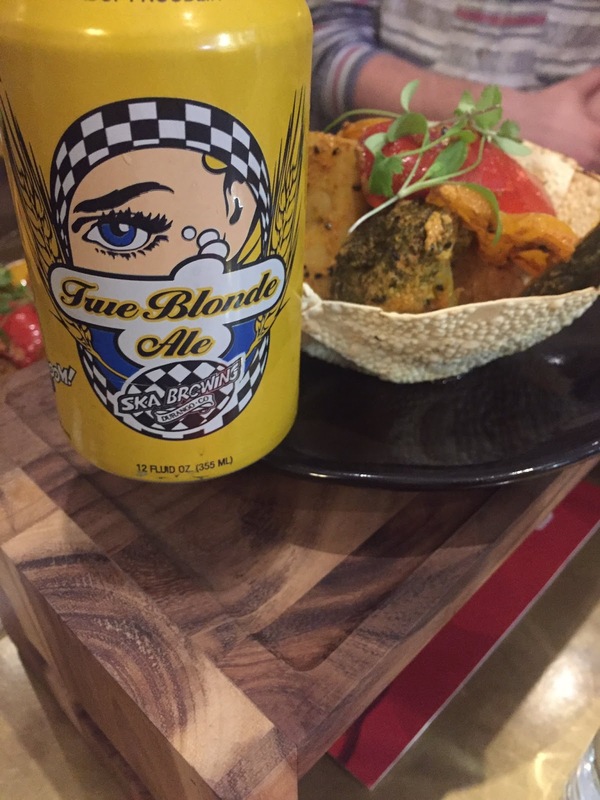 SKA True Blonde - 5% ABV (Tandoori Subji); This has a hint of honey and wheat, and is mostly Cascade hops. It worked very well pitched against tandoori vegetables which were yoghurty and heavily spiced. SKA Rudie Session IPA - 4.5% ABV (Malai Tikka); Brewed with Eldorado and Galaxy hops, this is fruity - citrussy with a hint of pineapple, and when paired with the herbed chicken dish, took on it's own herbaceous characteristics. A very accessible beer for non-US-hop-loving peeps like me...and possibly the first US IPA that I have ever enjoyed drinking! 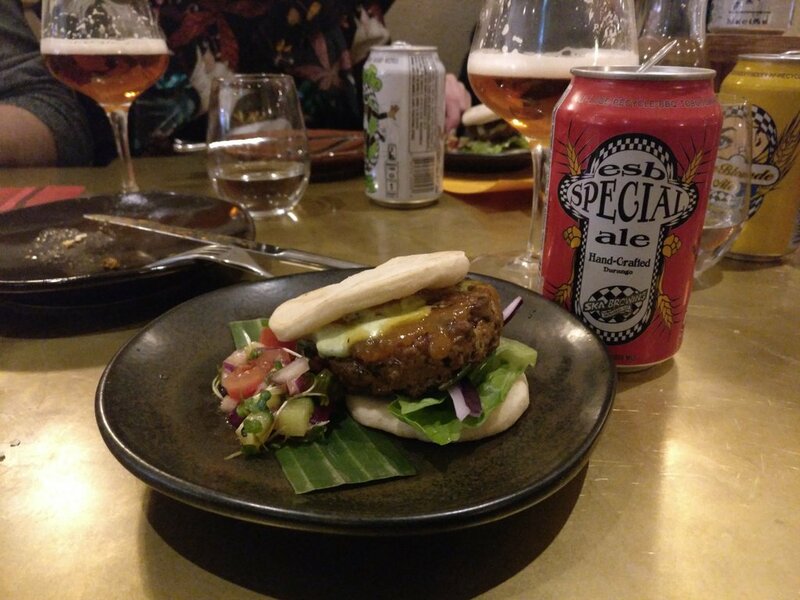 SKA Special ESB - 5.8% ABV ('Booma' Lamb Burger); This beer gives the impression of being quite boozy, with a big flavour, so it was a pleasant surprise to discover it was less than 6% ABV. Brewed with a hop I'm not familiar with - Galena - this is another take on a classic British style, and was the first beer SKA ever brewed. It also has the claim to fame of being the 2nd ever craft beer to be canned (only missing out on being the first by a week). Alongside the delicious and quite heavily spiced lamb patty it went down a treat. SKA Buster Nut Brown - 5.3% ABV (Khumb Chaat); I really enjoyed this beer, and it was possibly my favourite of the night. It's an earthy and autumnal flavoured beer, working very well with the mushroom dish. SKA Modus Hoperandi IPA - 6.8% ABV (Chettinaad Pork Ribs); This is their flagship and biggest selling beer, with bags of hops and pine but very well balanced. As this leans towards the heavy hopped US style IPAs this wasn't my favourite, but it did appear to be that of the rest of the room! It worked well with anise and spiced ribs which were the highlight of the night food-wise. SKA Modus Mandarina IPA - 6.8% ABV (Chocolate Mousse); This tasted both fresh and aged at the same time. The base beer is Modus Hoperandi IPA with orange added. There is a marmalade character accompanying the citrus and piney hops, it's big on flavour and stood up well to the chocolate and cardamom mousse. All in all it was a fantastic night and we had a chance to sample some great beers. 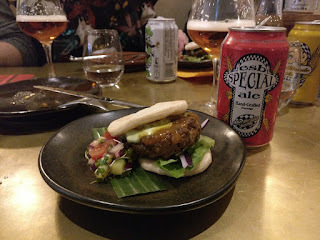 We were also incredibly impressed with the quality of the food at BOOMA, as well as the knowledge and dedication of the staff when describing the way the beers complimented the dishes according to their flavour profiles. After a sneaky peak at the 'normal' menu, we will definitely back to try some of the impressive combinations of craft beer and food which they've recommended. There are events all week for #londonskaweek which you can find out about by taking a look here or by following the hashtag on twitter. The Maltese soft drink, Kinnie, is a favourite in our household. It's bitter orange and herbal flavours transport me straight back to scorching hot summers in Sliema. I've written about my love for Kinnie here and I have to say that Kinnie is one of the best mixers for vodka. I'm always trying to think of incorporating Kinnie into recipes so when Lizzie Mabbott posted her Hong Kong inspired chicken wings in Cola recipe on her blog, Lizzie Eats London, I knew I had to try it with my beloved Kinnie. Sometimes the Kinnie experiments don't work but in this case it works perfectly. Kinnie is perfect for sticky Chinese style dishes - as it reduces it creates a delicious sugary glaze that is offset by the bitterness of the chinotto orange. Big props to Lizzie for inspiring this recipe. You can buy Kinnie on Amazon or at the Maltese cafe, Parparellu, in Hammersmith. Mix the chicken wings with the dark soy sauce in a bowl and marinade for a couple of hours. The key to wok based recipes is to make sure you have your ingredients prepped in advance. So while the wings are sitting in the soy, grate your ginger, chop your spring onions and crush your garlic. Heat up your wok, add the oil and fry the wings till the skin is golden brown. Take them out and put to one side. Add a little more oil is necessary and fry off your carefully chopped garlic, ginger, spring onions and the star anise. Put the wings back into the mix and add the light soy. Pour your Kinnie on top, bring to the boil and let it simmer for 30-40 minutes. Mix up the wings frequently so that they get an even contact with the Kinnie. As you reach the end of the cooking time look out for the sauce being reduced enough to cover glaze the wings. If it hasn't reached this point carry on simmering. Serve with white rice and napkins!